“After The Fall” is now listed on Amazon. It will be a recording of the November 14, 1998 concert at the New Jersey Performing Arts Center in Newark. Thanks to Maurizio for the information. This entry was posted in Releases on January 18, 2018 by Olivier Bruchez. 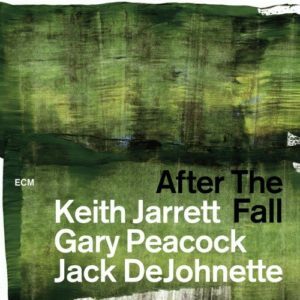 ECM will soon release a new trio album with Gary Peacock and Jack DeJohnette, entitled After The Fall. It will be a 2-CD album and is currently listed on Amazon and other online retailers with a release date of March 2, 2018. Nothing more is known about this release at the moment. Thanks to Adrian for the information. This entry was posted in Releases on December 30, 2017 by Olivier Bruchez. Over the past week we have begun the process of entering streaming, and from November 17th, the full ECM catalogue will be available to subscribers to services including Apple Music, Amazon, Spotify, Deezer, Tidal and Qobuz. This simultaneous launch across the platforms – facilitated by a new digital distribution agreement with Universal Music – invites listeners to explore the wide range of music recorded by our artists in the course of nearly five decades of independent production. Although ECM’s preferred mediums remain the CD and LP, the first priority is that the music should be heard. The physical catalogue and the original authorship are the crucial references for us: the complete ECM album with its artistic signature, best possible sound quality, sequence and dramaturgy intact, telling its story from beginning to end. In recent years, ECM and the musicians have had to face unauthorized streaming of recordings via video web-sharing sites, plus piracy, bootlegs, and a proliferation of illegal download sites. It was important to make the catalogue accessible within a framework where copyrights are respected. Most (all?) of Keith Jarrett’s albums seem to be available. Thanks to Luis and David for letting me know about this. This entry was posted in Releases on November 20, 2017 by Olivier Bruchez.